Platycodon grandiflorus 'Hakone Blue' has deep blue, double flowers on tall stems. It blooms the first year from seed if started early indoors. Double balloon flowers tend to produce single flowers as the season progresses, but they're still beautiful. Deer resistant. Drought tolerant. Balloon Flower plants are late to appear in the spring, so avoid digging around the area where they are planted until the foliage emerges. 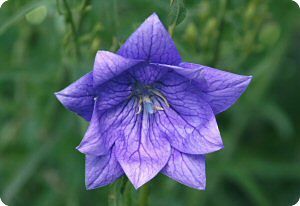 Balloon Flower is a long-lived perennial with single or double flowers in shades of blue, pink or white. Hardy in zones 3-9. Start balloon flower seeds indoors 8 weeks before the last frost date. Barely cover the seeds with soil. Full sun to part shade. Spacing 12". 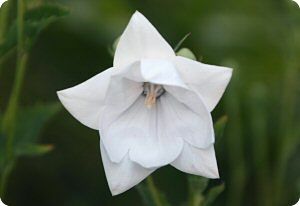 Platycodon grandiflorus 'Hakone White' is an elegant balloon flower with pure white, double flowers from midsummer to fall. It goes with nearly everything in the garden, and it's perfect for cutting. 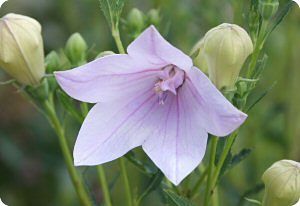 Platycodon grandiflorus 'Mother of Pearl' is a rare, pink balloon flower. It has large, pale pink flowers with deeper pink veins. The bushy plants are very floriferous. Also known as Platycodon g. 'Perlmutterschale'. Hardy in zones 3-9.